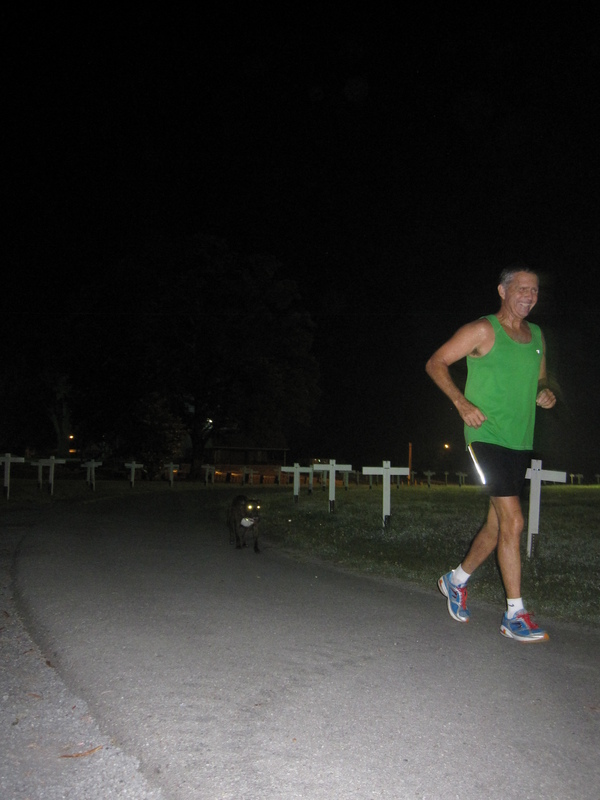 For ultramarathon runner Richard Westbrook, Kansas was a sloppy hellhole. Athletes ran 64 individual stage races, with nary a day off, ranging from 28 to 62 miles per day. Twenty-five of the world’s best ultramarathoners began the race, and 13 crossed the line in New York. Westbrook was the master’s division (over 40) champion and came in fourth overall, 15 hours and 57 minutes behind the winner, 35-year-old David Warady of Huntington Beach, Calif.
Westbrook began running ultramarathons in the early 1980s after completing a number of regular marathons. 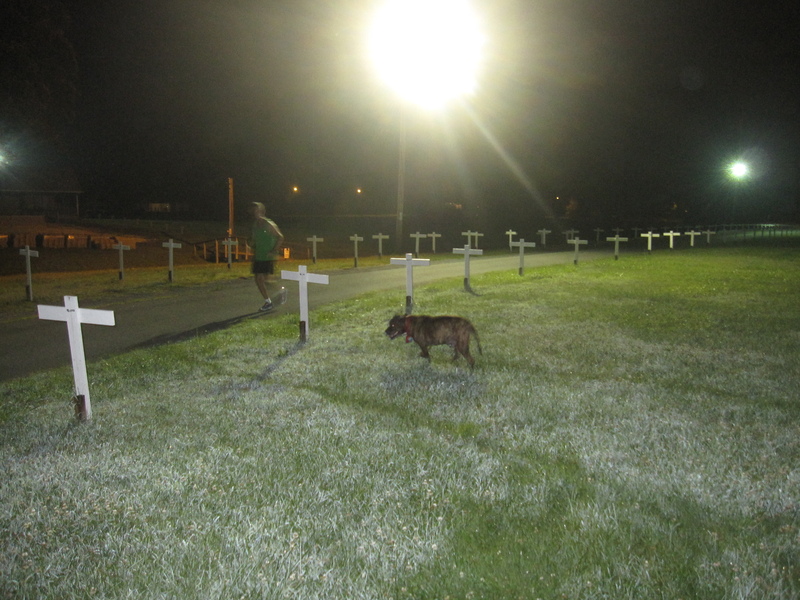 He decided to run this race to get an eyeful of America. It is said that marathon runners hit a “the wall” at around the 20-mile mark, when the body begins to rebel against the abuse being heaped upon it. In this race Westbrook slammed into his wall at around mile 1,950. He already had covered the Mojave Desert in 110-degree heat and scaled the Colorado Rockies, including 12,000-foot Loveland Pass. Hannibal, however, was not so kind. 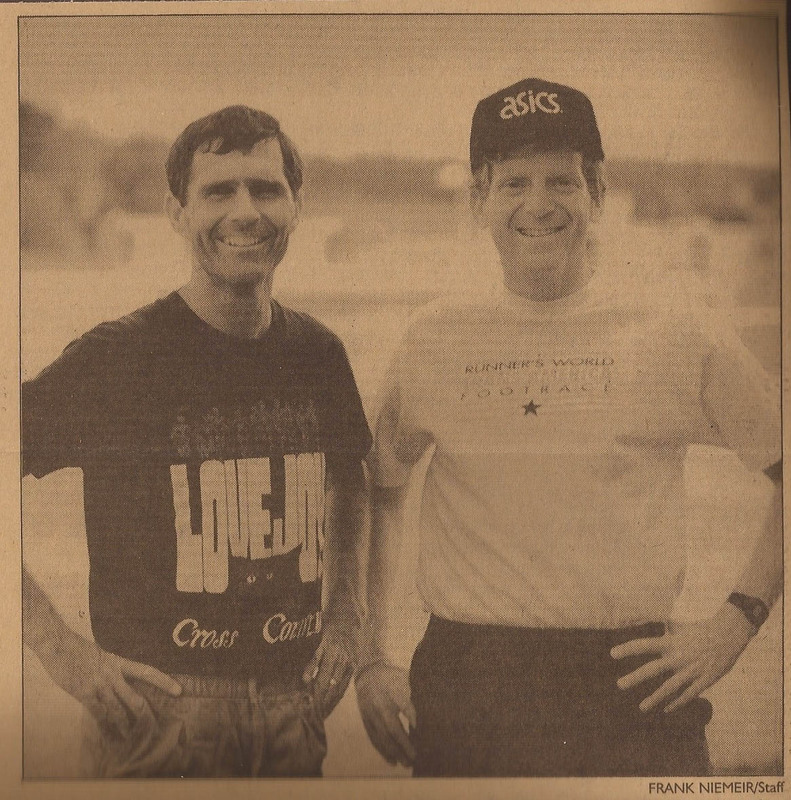 LOVEJOY HIGH SCHOOL cross country coach Richard Westbrook (left) was fourth overall behind David Warady in an ultramarathon across the country. They manipulated the calf area, put some inserts in his shoes, gave him some medicine for the inflammation, and strapped on an ice bag. Then, through the entire states of Illinois and Indiana, Westbrook alternately ran, jogged, and walked, stopping intermittently to strap a new bag of ice on once the last one had melted. Although his pace slipped below the disqualification cutoff time on several occasions while he was on the course, Westbrook was always able to surge just enough to stay in the race. “I would get into the run and be behind the cutoff time, but I would be getting closer and closer to making it,” he says. “I figured if I could just put up with the pain and keep jogging that by the end of the stage I would be close enough to the cutoff time to gut it out and get under it.” Westbrook says that the pain in his left leg began to subside about the time he crossed into Ohio, and he was then able to get back on the good foot. 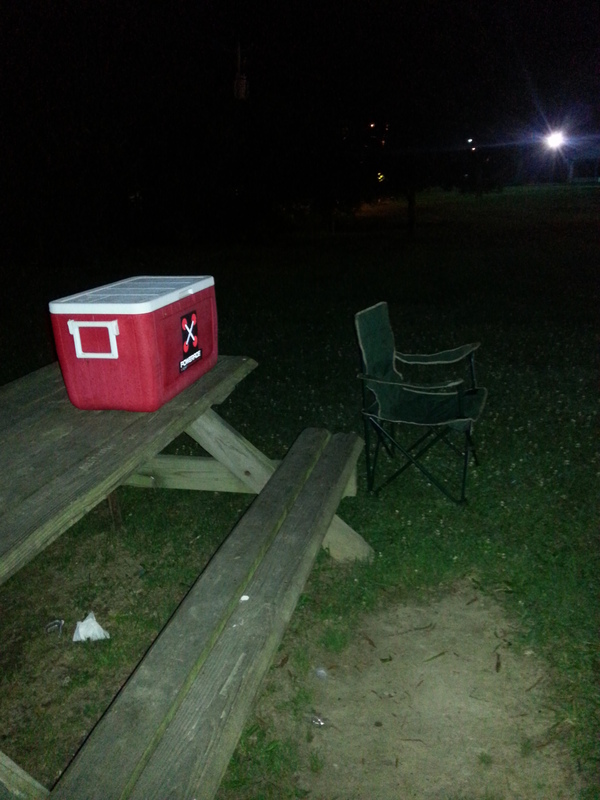 Accomodations were another daunting aspect of the race. Forget four-star hotels. Competitors stayed in stuffy, un-airconditioned high school gyms, National Guard Armories, Legion Halls, churches, and sometimes on the side of the road. Fuel was another problem. The race organizers estimated that during the event each runner would burn close to 384,000 calories. Westbrook did the majority of his chow hounding at dinner. 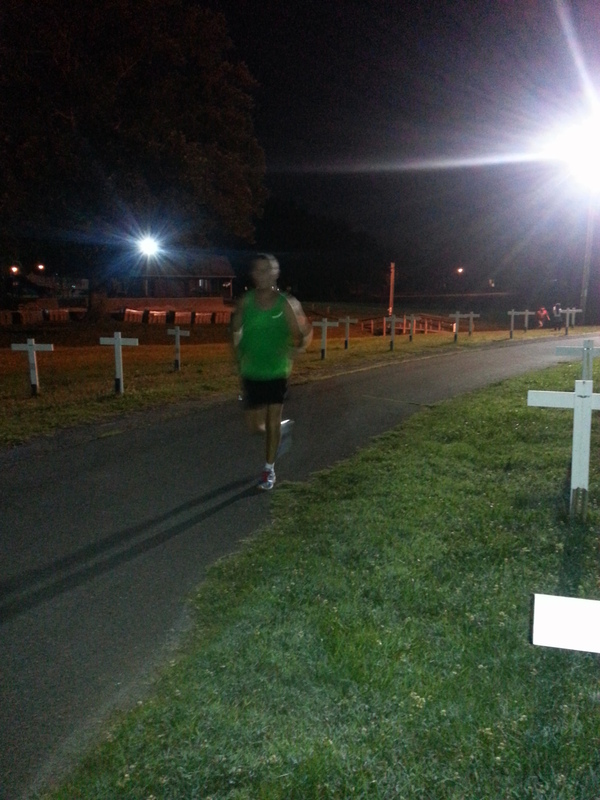 And, to keep cost down, the runners were fed after each stage by groups from organizations like local churches. The meals, however, became depressingly predictable. The finish in Central Park, which came after logging more than 4 million strides across 13 states, was an almost spiritual epiphany for Westbrook. “We came into New York over some peaks and you could see the skyline,” he recalls. 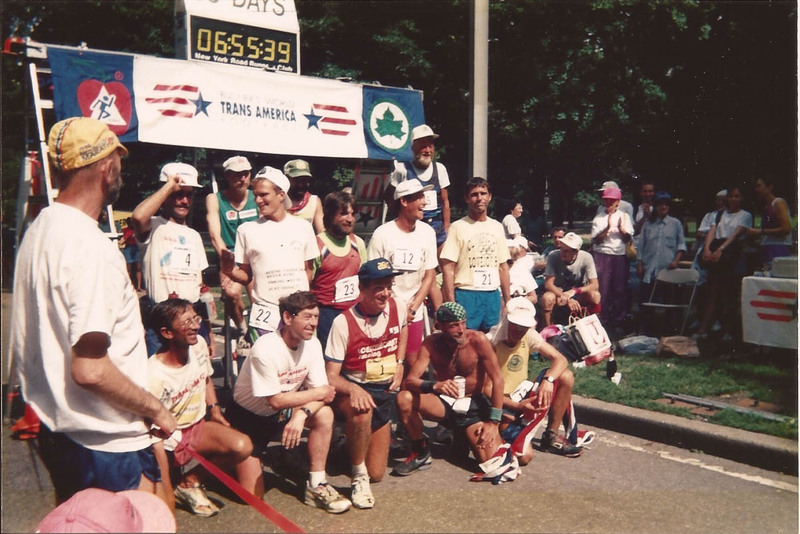 “The first time was saw the pinnacles of the George Washington Bridge, everyone wanted to sprint, but we still had quite a few miles to go. Richard Westbrook shaking hands with Harry Abrams, the lone survivor from the 1929 TransAm race. Back in America’s physical fitness dark ages, before long-legged lopers like Frank Shorter and Bill Rogers inspired a distance-running frenzy, marathoners were seen as endorphin-addicted, masochistic kooks. Nowadays housewives and short-order cooks are common on the 26-mile, 385-yard circuit. Today the kook factor is assigned to ultramarathon runners, true self-infliction aficionados who trot double, triple, 10 times, and even 100 times the marathon distance justfor the pain of it. Or, rather, just to see if they can cross the finish line alive. One such well-callused survivalists is Rich Schick, a physician’s assistant at Woodstock Hospital and the former coordinator of the Atlanta Track Club’s ultramarathon team. Schick, 43, ran his first ultra marathon, a 100K race in Switzerland, in the late 1970s after having run close to 100 marathons. 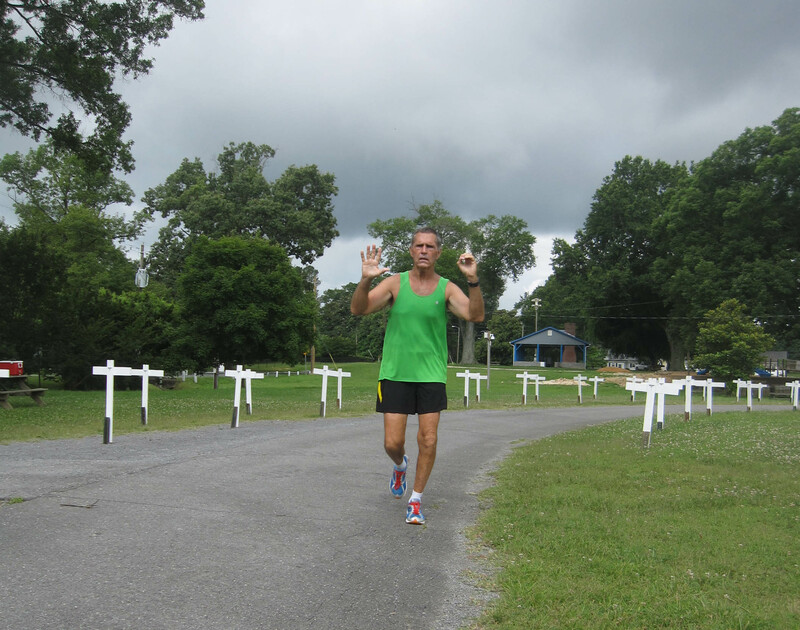 He has completed some 60 of the grueling ultra treks. Dr. Martin says anyone thinking about tackling an ultramarathon should do it gradually. “l think just as a good coach counsels younger runners who are moving up from the high school mile to the 5K or 10K in college not to try a marathon until they’re out of college, I think the same thing applies to someone contemplating an ultramarathon,” he says. “If you find 10K races are too fast for you, but you find it easy to run longer distances, try l marathon. If you find you can finish marathons with no problem but you have trouble trying to run them quickly, then jump into an ultramarathon. The only local ultramarathon is the Stone Mountain 50-miler, which takes place in January. 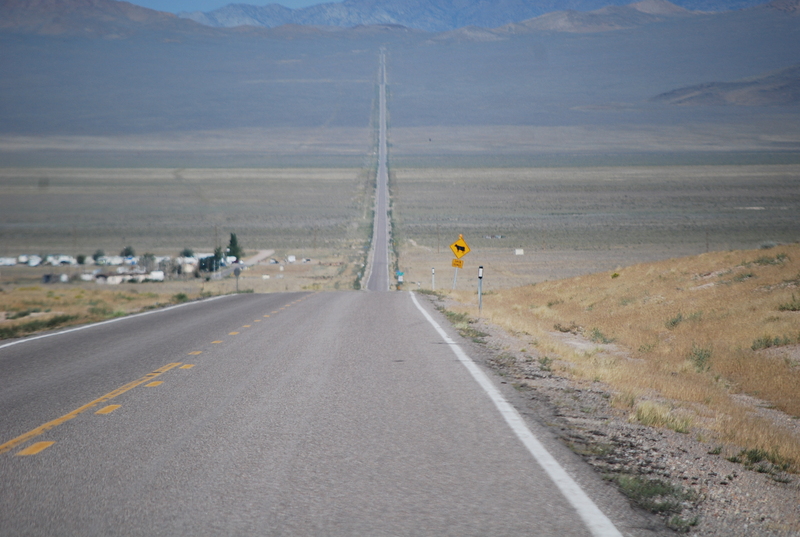 Richard Westbrook, ran the length of the Extraterrestrial Highway in Nevada (NV) consisting of State Road 375. 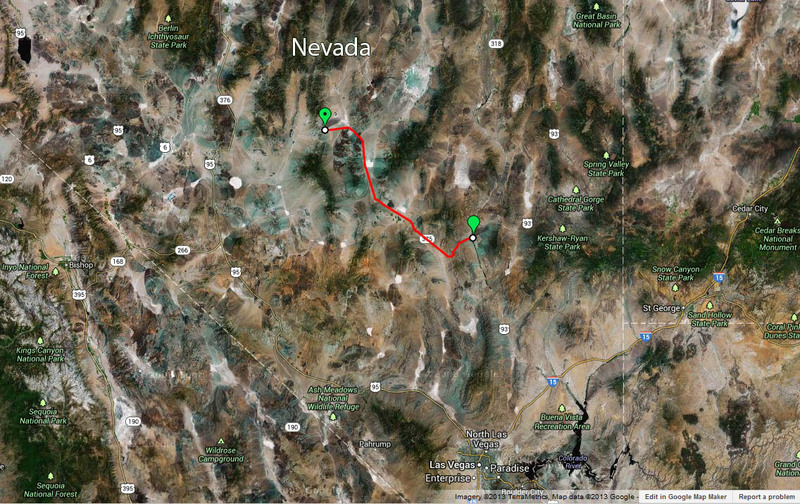 It starts on US 6 going east out of Tonapah, NV at Warm Springs, NV. 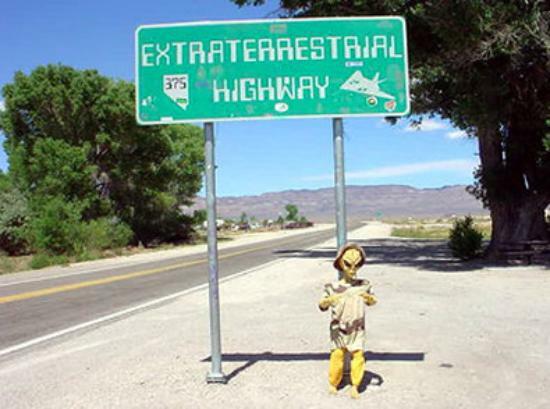 The ET Highway ends at US 93 north of Las Vegas. The entire route is 100 miles of ET Highway. 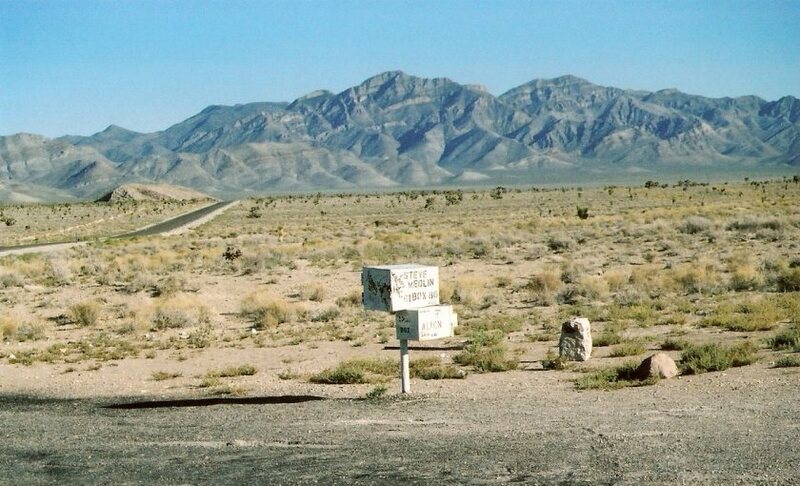 Sites to take in along the way include the black (now white) mailbox as the only indication of Area 51 along the ET Hwy. 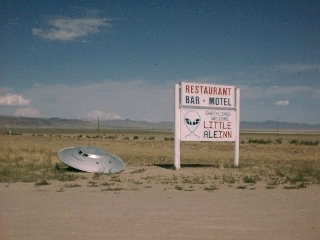 In the town of Rachel, NV there is the infamous Ale-Inn where many people come to stay and try to spot some UFOs. Richard claims to have seen nothing out of the ordinary, but who knows if he would really tell. I guess 100 miles is not enough distance to him for delirium to set in either. A few days ago, my granddaughter found an old 8-track tape in a closet and promptly asked what it was. After being told, she wanted to hear the tape. Of course, we did not have an 8-track tape player. So, it went unheard. Then, later in the week, I went to Phiddipides at Ansley Mall to buy a pair of running shoes. As I sat there trying on the shoes and gazing at the wall covered with shoes, I thought back to the time I evolved from the Adidas Italias to the brand new Nike Cortez. The difference was like that between night and day. I thought about this because the shoes I was buying now were closer to being like the old Italias than they were to the Nike Cortez that revolutionized the running shoe industry. And, I was buying Nikes. This reflected a change in the running shoe business. The way my mind works brought me to thoughts of technology in today’s world; the way we react to that technology; how we as runners fit into the world of advancing technology compared to the world of basic nature. My shoe purchase reversed my direction from my recent running shoe trend in that I was going backwards compared to the obvious technology in most running shoes today and in the dominating philosophy of the major running shoe companies…including Nike. It was like the running shoe companies were backtracking in their design and philosophy. This whole bubble of modernization and technology engulfs the runner of today just like it does everyone else. Still, one of the major appeals of running for many people, including me, is the simplicity of the activity. As they say, it is a sport that needs only good shoes and determination. Even in our simplicity, we can see, use, or reject the oncoming technology. An example is the GPS equipment that can tell the runner where, the distance, elevation, pace, and such of the run. Just put it on your wrist and take off…it will do the rest. It is there to use. Just take it or leave it. Another major appeal of running expressed by many people is the connection to nature. This may partially explain why trail running is exploding in numbers. There are those who run only on trails and race only on trails. Then, there are those who will hit the trails just part of the time. And, we have those who never run on trails. We are speaking here of nature trails. Those trails through the woods or in the open but are surfaced with earth and not pavement. We are not talking of the multi-use trails that are paved to accommodate road bicycles, skates, and skis on wheels. Such a trail is the very popular Silver Comet Trail from Smyrna, Georgia to the Alabama state line. One may think that a runner needs to be on nature trails running along with the sound of the wind rustling the leaves of the forest in order to be “in” nature. Not so. If you are “out there,” you are in nature. As soon as the runner goes out the door, that runner is running in nature. This fits one of Webster’s definitions of nature, the external world in its entirety. That is nature for the runner. This does not include running indoors or treadmill running, unless, maybe, the treadmill is outside. We, as runners, are active participants in nature. The runner running in downtown Atlanta is running in nature just like the runner running the Appalachian Trail. I run in nature when I run my familiar routes in my neighborhood…all on roads. One site of nature is no better than another site of nature. It is just a different nature site. The runner may prefer the sidewalk in the nature he or she runs through while another may prefer the local park with asphalt and grass trails; while another may choose the wooded trail with its roots and rocks and stream crossings. All of it is nature. The difference may be the intensity of the nature setting. The intensity of nature would be the degree of completeness of the environment that would reflect the lowest level of interference from man. The Appalachian Trail would reflect less interference than the Silver Comet Trail. So, one might think the A.T would be “more” nature. This might be true of the common pedestrian through such settings. But, not for the runner. A runner’s nature is where the runner happens to be running at the time as long as it is out there. This is because the runner will be more aware of the setting being run through than anyone else passing through the same. A runner is able to sense more because running will heighten the senses because of the body and mind’s reaction to the activity. Any runner can tell of experiences in which their surroundings during the run seemed more intense with color, clarity, smells, sounds, and many other sensations that made the run memorable. And, this is not uncommon. In fact, it is so common that we hardly hear or read about the phenomenon as we did in the early running boom days. It has become commonplace. But, that doesn’t mean that it is not there and not important to enjoying the running. The runner is an athlete. The runner is an athlete in nature. The runner relates to nature in ways in which most other athletes can only read. It happens to the runner in the cities, the forests, the deserts, the mountains, the parks, the beaches, on the sidewalks, the roads, the trails. The sensations abound. The senses are on high alert. The mind is processing everything with more clarity than at other times. This makes the runner one with his or her nature. That nature is anyplace and every place outside. The runner becomes an animal in nature. The more the runner feels like an “animal,” the more intense the running experience in nature becomes. The runner may be unique in reaching this state of mind. The true runner has a calling to keep reliving the experience with nature. This helps running become a way of life. We runners need to keep our awareness of the experience alive. We need to enhance our appreciation of the experience. On your next run, tap into the colors around you be it city or country. Listen to the sounds be they city hubbub or forest rustlings. Smell the odors from the pavement or the trail…see what you can detect wafting through the air. Relate to the sounds of your breathing and your feet striking the surface. Be aware of your body’s motion and position. Let your mind absorb it all. The mind will give you a high definition picture better than any modern product of technology. It will be your picture of your nature. You will have it, enjoy it, and remember it. You will repeat it. Later runs will do that for you. You will be an animal in nature. You will be running and be a better person because of it. If you are lucky, you will even be a better animal. Enter the runner. Enter this individual who puts constant forward locomotion in a priority position in his or her lifestyle. Enter this person who is concerned with basic principles of life that will help his or her running, and, in turn, the running will help the quality of life of the individual. A broad, sweeping picture of the runner will include a concern of one’s health. It will include a concern for the environment. Seeing a need for discipline in our society will be a real factor for the survival of the desired society. Education at various levels will be of prime importance. Patriotism at ebbing levels of intensity will be a basic characteristic. Freedom will be a basic right, and this freedom will invade all areas of the chosen lifestyle. Integrity will be bonding cement holding the individual to a high standard. Courage to be true to his or her beliefs, culture, religion, or lack of religion will be a basic aspect of philosophy. All this blends to make the runner happy in his or her lifestyle. Happiness is recognized as a pursuit of life. All these strokes in the runner’s picture will be glazed with the approach to the running. It will affect all the aforementioned items. Some will be affected in a highly obvious manner; some will be very subtle. But, all will be very real. A clear example would be in the runner’s training method for racing. The runner has quickly learned that the racing returns will equal the level of training. There is no way around it. It is education, discipline, and integrity all wrapped up in one pursuit…that of training to race better. If the runner slacks off, the racing improvement will be less or non-existent. Operating in a systemic fashion has made it possible to evolve into the present human animal. Our being depends on how well our systems work. Our systems, such as the circulatory and respiratory, make our life with its movement possible. All our systems are integrated to give us a certain quality of life. Indeed, the better the systems, the higher the quality of life. A true runner recognizes this as basic to happiness. So, how does the runner assimilate the barrage of philosophical and political information coming his way? What does the runner think about the threat of terrorism to our nation? Do the impending health care parameters set by the federal government interfere with the runner’s idea of freedom? Is the whole idea of health care in opposition to self-discipline? Where does the level of responsibility lie for care of the environment? Are our economic woes wrapped up in the lack of integrity on governmental and corporate levels? Is it integrated with the individual? Do we have a problem in this country with the lack of morals? Is political correctness a plague? Is our educational system suffering because of non-teachers setting the parameters of success? I know and talk to some running friends and acquaintances and find that they are fairly common and consistent in their basic philosophy concerning the previous questions. There is room for differences which is refreshing and logical in that we are dealing with free thinking humans. But, my sample is a very small portion of the running population. I wonder what a larger portion would think about these things. Ask yourself how you feel about the questions. What is your basic philosophy in dealing with society’s questions? Then, dig deeper into your mind and investigate how your running influences your answers…and vice versa. I’ve done this and have come up with different answers at different times in various situations. Why? I’m still trying to figure that one out. Let me know – if you will – what you find out in your personal investigation. 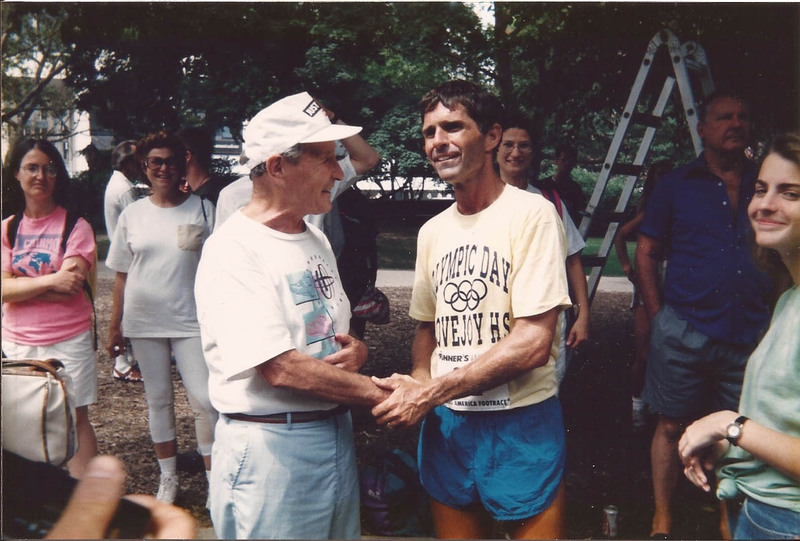 It may be interesting for you, as it was for me, to discover the connection between your running and your beliefs, attitudes, and philosophy be it in the personal or political arena. And, if you are a young runner and all the questions may not apply to you at present, then think about those that do apply. But, know this, you are on your way to formulating your philosophy concerning all the ideas. Think about how you, as a running human, will be affected by your running. It will be interesting. You can let me know any results of your thinking by leaving a comment.